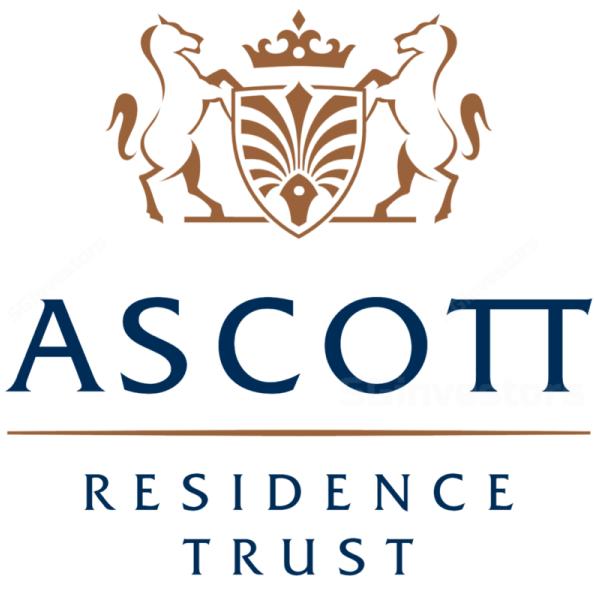 Ascott Residence Trust (ART) is an owner-operator of serviced residences (SRs) with 79 properties totalling 11,430 keys spanning 14 countries. c.85% of gross profit is derived from its eight key markets – namely, the US, Japan, UK, France, Vietnam, Singapore, China and Australia. ART’s SRs, excluding its US properties, are operated under three core brands – Ascott, Citadines and Somerset. Ascott Limited, ART’s sponsor, is a wholly-owned subsidiary and the hospitality arm of Mainboard-listed CapitaLand Limited (market cap S$15.3bn). 41% of gross profit is stable, derived from master leases (ML) and management contracts with minimum guaranteed income (MCMGI) while the remaining 59% is derived from management contracts (MC), thus providing upside potential. 70% of the room stock is for long-term stays and the remaining 30% for higher-yielding short-term stays. 75% of EBIT is sourced from five core developed markets. ART’s Sponsor, Ascott Limited, has grown its presence at a CAGR of 36.5% over the past three years to 100,000 keys over 172 cities across 33 countries as at 21 January 2019. Ascott Limited is targeting 160,000 keys by 2023. ART is poised to benefit from Ascott’s brand awareness and economies of scale. ART currently has a right-of-first-refusal (ROFR) pipeline of 20 properties. Following the divestment of Ascott Raffles Place, ART’s gearing is expected to fall 2.2pp from 36.7% to 34.5%. Given ART’s significant asset base of S$5.3bn, this translates to a debt headroom of c.S$880mn (assuming a 45% gearing level). With 70% of room stock used for long-term stays, less wear and tear is observed in comparison with hotels as there are less frequent turnovers. In addition, SRs only offer limited services, unlike hotels which offer a full range of services, which translates into lower CAPEX and manpower requirements. Substantial room supply hitting several markets that ART is operating in will put downward pressure on revenue per average unit (RevPAU). Unfavourable foreign currency movements, mitigated by ART’s forex hedging strategy and diversified portfolio. 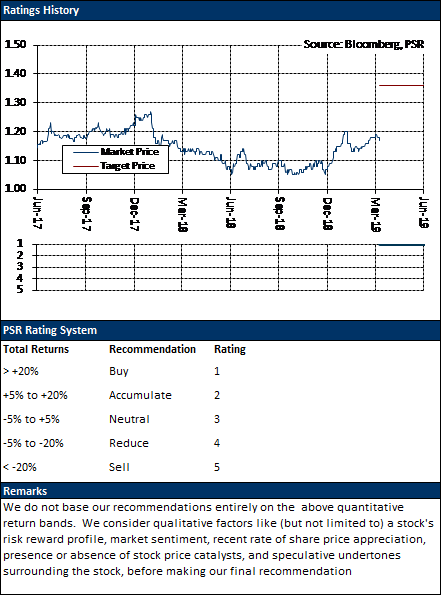 We initiate coverage on ART with a BUY rating and a DDM-derived target price of S$1.36. This implies a 21.5% upside and a FY19e P/NAV of 0.80. ART’s assets are leased out on three different types of leases – master lease (ML), management contract with minimum guaranteed income (MCMGI) and management contracts (MC). Under a triple-net lease, master lessors are responsible for the property taxes, insurance and maintenance, resulting in high gross profit margins. 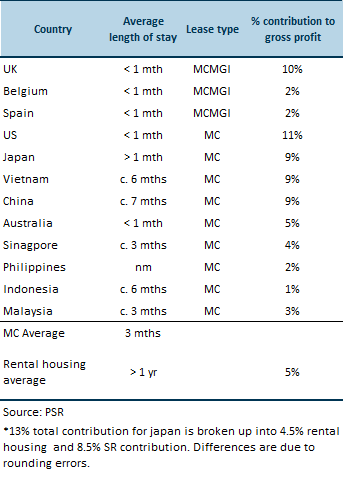 Due to the longer lease terms, the master leases in France, Germany and Australia are subject to annual rental reversions pegged to the consumer-price index (CPI). Ascott Orchard’s lease includes an additional variable component. Operating income from management contracts are dependent on the RevPAU of each asset. RevPAU is a function of the occupancy rate and the average daily rate (ADR). Income is tied to the profitability of the SR and ART is responsible for the day-to-day cost of operations as well as CAPEX outlays. Hence, profit margins for this revenue model have a wider range and are thinner compared to MLs. 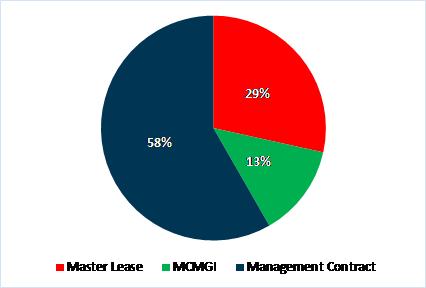 Similar to management contracts, MCMGIs are driven by RevPAU and profitability of the SR. However it is downside protected as the operator guarantees to pay the shortfall should income be lower than the pre-agreed minimum income level. MCMGIs allow ART to participate in the upside of the SRs. All of ART’s MCMGI assets are currently contributing more than the minimum guaranteed income. With the divestment of Ascott Raffles Place (previously under master lease) and acquisition of Citadines Connect Sydney Airport and Lyf One-north (to be operated under management contract), a higher portion of gross profit will be derived from management contracts which have lower profit margins associated with them. Corresponding, we expect gross profit margins to deteriorate 1pp from 46.5% in FY18 to 45.5% in FY20. ART’s longer stays are driven by the corporate segment which clock in stays ranging from a month to two years. Some business travellers are MICE organisers or expats on overseas project group assignments that last between 3 to 6 months. PwC’s talent mobility study show that overseas assignee levels have increased by 25% over the past decade and it is estimated that there will be a 50% increase in overseas assignments in 2020 driven by short-term and commuter assignments. SRs are priced slightly higher than hotels but units are generally 30-50% larger compared to hotels, hence more competitive on a per square foot level. They are also amenitised with cooking facilities which are favoured by some guests. An Association of Serviced Apartment Providers’ survey on SR operators in the UK reported that across the board, members saw their Chinese-sourced business increase by 5 to 50% YoY in 2018, with majority of the guests from China being leisure travellers. Direct costs comprise staff cost, depreciation and amortisation, property tax and insurance which mostly accrue from the management contract revenue model. Staff costs and depreciation and amortisation account for 20% and 13% of direct costs respectively. Finance costs include the cost of forex hedging and interest rate swaps. 80% of debt is on fixed terms with 96% of total debt expiring after 2020. Our valuations have factored the acquisition of Citadines Connect Sydney Airport which was announced on 28 March 2019. 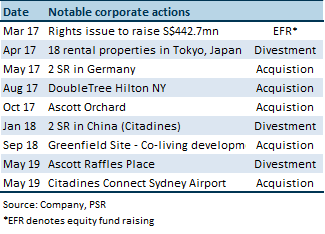 Figure 6 below summarises notable transactions that have occurred in the last two years. 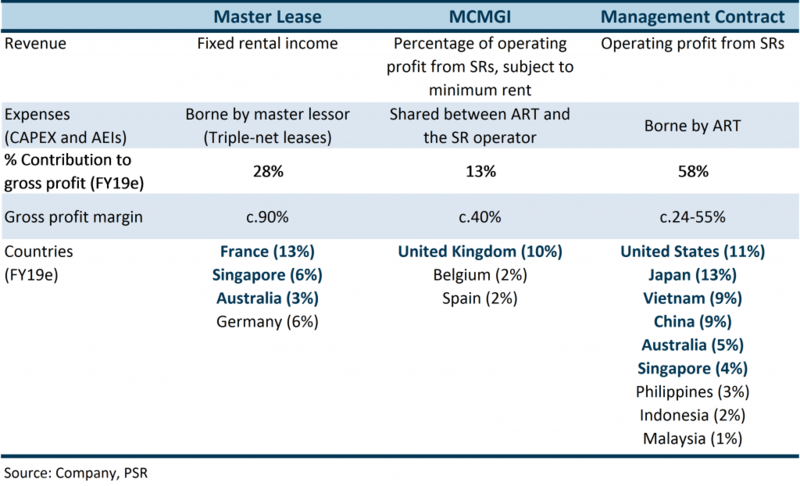 41% of ART’s gross profit is derived from stable streams (master leases and MCMGI) while 59% derived from management contracts provide upside from variability. 70% of room stock is used for long-term stays, with the remaining 30% room stock for higher-yielding short-term stays. The average length of stay in most properties ranges 1 month to 2 years which affords income visibility and cushions transient vacancies or scheduled AEIs. Additionally, 75% of EBIT sourced from developed markets which further speak to the stability of income. Long term stays are driven by the corporate segment’s business travels, meetings, incentive travel, conventions and exhibitions (BTMICE) needs as well as out stationed executives working in project groups. As such, there is less cyclicality compared with hotel operations, which is primarily tourism driven. In Singapore, there is a distinction between the licenses meant for long term stays and short term stays. Other countries do not have this distinction. Serviced residence licenses mandate a minimum stay of one week while hotel licenses have no minimum length of stay requirement. Of their four SRs located in Singapore, Ascott Orchard and Ascott RP (divested), which is located along the prime shopping district and CBD respectively, hold the hotel license, allowing them to benefit from the tourist influx in Singapore. These two assets are operated under master lease with a participating variable component. ART has benefitted from this pre-emptive of applying for the hotel license as the average length of stay at Ascott Orchard is currently less than one week. 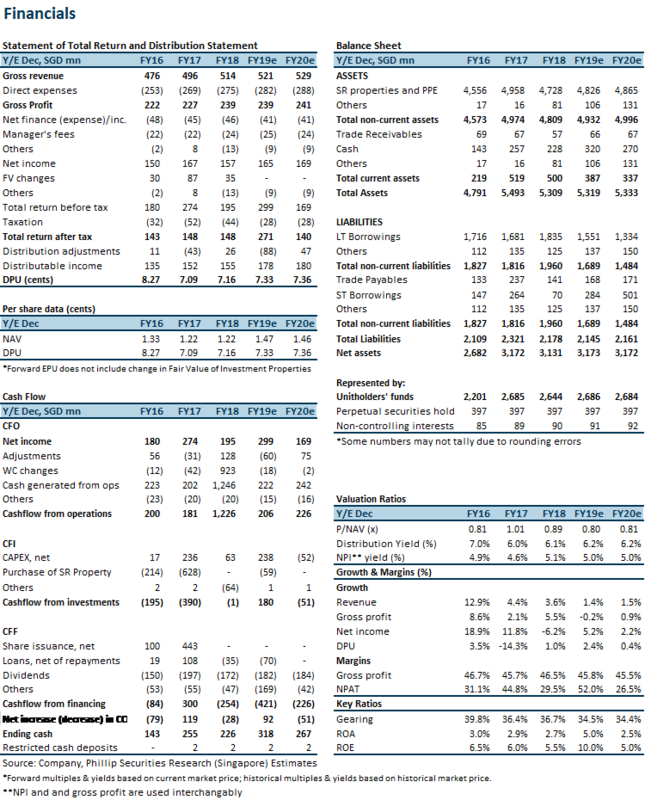 Post (Ascott RP) divestment gearing expected to fall 2.2pp from 36.7% to 34.5%. Given ART’s significant asset base of S$5.3bn, this translates to a debt headroom of c.S$880mn. This is sweetened by ART’s ability to borrow at a low cost of debt of 2.3%, giving them an advantage over REITs with higher borrowing costs, which means that more projects would be yield accretive to ART. Over the last 3 years, the number of keys under Sponsor Ascott Limited has been growing at a CAGR of 36.5%. from 39,000 to 100,000 keys. The signing of 28 management contracts (totalling 26,000 keys) in China in January 2019 enabled Ascott Limited to achieve their 2020 target of 100,000 keys ahead of schedule. Ascott is targeting to operate 160,000 keys by 2023. In 2018, the global construction pipeline for the hospitality sector reached a high with hospitality heavyweights such as Marriot, Hilton, InterContinental and Accor accounting for 55% of the 13,571 projects/2.3mn rooms in the global pipeline. Developer-operators like Banyan Tree have also refined their strategy, choosing the asset light approach and ramping up the number of keys through management contracts. 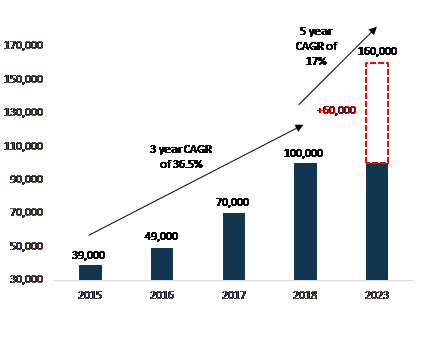 The strategy of increasing the number of keys globally enables operators to build brand prominence as well as take advantage of economies of scale. With most of ART’s assets operated under the Ascott, Citadines and Somerset brands, ART is poised to benefit from the brand and reputation that Ascott has built. Lyf One-north is ART’s maiden development project and first co-living asset. It is located in Singapore and holds a SR license and will be managed by Ascott. The co-living concept is targeted at executive millennials and expatriates who prefer a more social and experiential environment. One-north is dubbed Singapore’s research and innovation hub, where numerous young entrepreneurs and start-ups congregate. Co-living accommodations have shared common spaces such as living rooms, kitchens, and working spaces. It gives tenants the luxury of typical amenities in a home without having to incur the cost of additional space and investment in furniture and appliances. The sharing economy has enabled co-living operators to reduce individual unit spaces but still provide these amenities without the cost of duplication. Hmlet, one of the first movers in the co-living space in Singapore, started operations in 2016 and currently has 18 properties totalling 1,000 beds. Hmlet rents and renovates properties to eventually sublet them. Apart from expatriates, their clients include couples that require transitional housing while awaiting the completion of their flats. Sponsor Ascott Limited has four co-living properties in the pipeline totalling 784 units and intends to increase the number of keys from this segment to 10,000 by 2020. Including ART’s Lyf One-north, there will be 1,080 Lyf units. ART’s Lyf One-north will stand to benefit from the scale and presence of the Lyf brand. Ascott Limited has granted ART the ROFR for its properties – regardless of the developmental or operational stage – that are used as serviced residences or rental housing properties in Europe and Pan-Asian region. Currently, there are currently 20 properties at various developmental and operational stages in ART’s ROFR pipeline. With 70% of room inventory used for long-term accommodation, less wear and tear is observed in comparison with hotels, which experiences more frequent turnovers. CAPEX is generally broken into two categories, maintenance and improvement CAPEX. Improvement AEIs are undertaken to refresh the property or upgrade the PPE which will translate into higher RevPAU from the improved asset. Maintenance CAPEX is incurred to replace existing PPE and furniture and fittings with similar (or newer model of) equipment to serve the same function, and as such will not increase RevPAU significantly, but rather help to maintain the current RevPAU. We expect less maintenance related CAPEX spending due to less wear and tear, which will provide better profit margins and less disruption to the business from closure of rooms for renovation. Unlike hotels which offer full range of services, SRs only offer a limited selection of services, which translates into lower CAPEX and OPEX requirement. 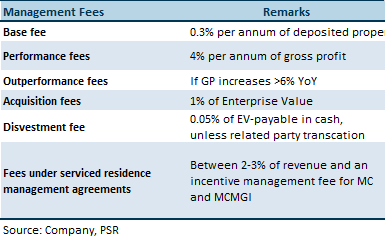 As master leases are triple-net and only receive a fixed fee (except Ascott Orchard), only properties under MCMGI and management contract will stand to benefit from the CAPEX and OPEX efficiency of SRs. The 11 rental housing properties in Japan are also minimally furnished. Some SRs have F&B outlets on the premise or shared, self-service, pay-per-use amenities such as washing machines. The limited selection of services also corresponds to lower manpower requirements. CapitaLand announced the acquisition of Ascendas-Singbridge on January that is subject to shareholder vote on 12 April 2019. Ascott Limited, ART’s sponsor, is 100% owned by CapitaLand. If the acquisition of Ascendas-Singbridge is approved, CapitaLand will own 27.72% of Ascendas Hospitality Trust (AHT). 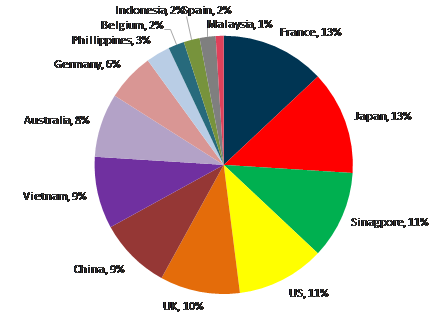 AHT has 14 assets which are located in Singapore (1), Australia (6), Japan (5) and Korea (2). 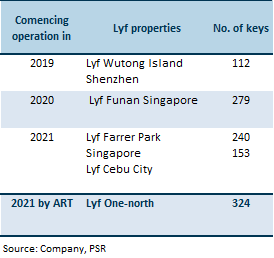 CapitaLand’s Management commented it would be more likely to merge ART and AHT or divest its stake in either ART/AHT, than to modify the investment mandates of the two REITs. Substantial room supply hitting several markets that ART is operating in – namely, Japan, China, Germany, UK, Vietnam and Australia – will put downward pressure on RevPAU. There is also risk of unfavourable foreign currency movements in the countries which ART operate. These factors are mitigated by ART’s diversified portfolio which no geography accounts for more than 15% of gross profit. Historically, ART’s forex hedging strategy of hedging distributable income in EUR, GBP, JPY and USD has limited the impact of FX movements on gross profit, keeping it in the range of +/- 1.4% in the last 5 years (impact of FY2017/18 FX fluctuations on gross profit was 0%). We initiate coverage on ART with a BUY rating and a DDM-derived target price of S$1.36. With a DPU yield of 6.3%, this implies a 21.5% upside. At a discount to P/NAV of 0.80, we find ART to be attractive. Natalie covers the REITs and Property sector. Previously a business analyst with a management consultancy, she handled feasibility studies and business optimisation and restructuring projects. She has worked with companies from varied industries including logistics, FinTech, EduTech, gaming, F&B and retail. She graduated with a Bachelor of Science (Honours) in Banking & Finance from the University of London.